A new research report has given us an in-depth look at the variations between popular emoji characters and how they are perceived by individuals that receive them on varying device types, often resulting in entirely different interpretations. How varied can this experience be? Let’s find out. Titled “Blissfully happy” or “ready to fight”: Varying Interpretations of Emoji, the report delves into the world of emoji in a way that more than likely hasn’t been done before. There’s a whole ton of information and history of emoji covered, but one of those most interesting aspects chooses to look at a problem that we have probably all faced at one point or another in our texting and social media experience; the fact that different devices are designed to interpret and display different emoji characters in a different way. 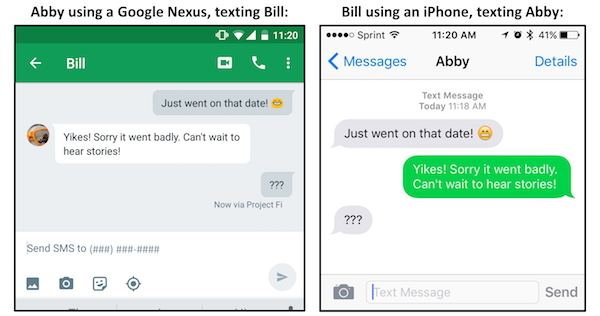 That in itself can cause mass confusion amongst people talking to one another on different device platforms and networks through means of messaging. If you’re an iPhone or iPad owner who regularly sends or receives messages with emoji characters, then the chances are that you’ve fallen foul of the “grinning face with cheery eyes” emoji, also known as the “constipated face” emoji. If received on one of Apple’s iOS devices, this cheeky little characters instantly conjures up negative connotations and actually looks like an icon that’s used to project guilt or negative feelings toward someone or something. Conversely, if you receive the exact same emoji on a Samsung device then you are looking at a beaming happy smile with rosy cherub cheeks that instantly shows happiness and joy. The same goes for viewing the same character on HTC devices, stock Android devices, Windows Phone, and more. 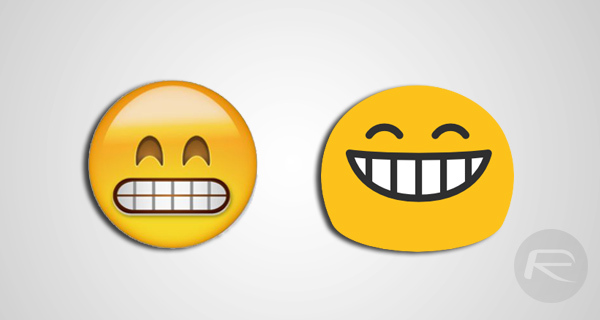 The research team have taken the opportunity to use the differences in how these emoji are displayed to engage the general public on the type of feeling that each emoji conjured up with being viewed on different devices. The “grinning face with cheery eyes” emoji was subjected to a rating ranging from extremely negative to a positive emotions inducement. With Apple, the emoji was rated at -1 just below neutral, but Samsung, LG, and Google (Android) raked in a +4 rating throwing it in the “happy, excited” side of things. Considering that a recent report suggests that nearly half of all text on Instagram contains emoji characters, and the fact that the Oxford Dictionary declared the “face with tears of joy” to be last year’s “word of the year”, it’s becoming increasingly evident that not only do emojis play an important part of communication in the modern world, but that they can also affect the tone and direction of a conversation when used on different platforms. Given this research, and the insights that it produces, we have to wonder if Unicode will look to clarify some of the descriptive data that is assigned to each little character, but given the varying platforms and their take on emoji’s it is definitely an uphill task. Seriously, this is just fucken stupid. that was a beautiful backfire!